At Winning Smiles Dental Surgery we realize that are as many different types of wisdom teeth as there are people in the world. Call us today so we can improve your dental health together. At Winning smiles dentists, our most experienced dentist provide teeth related treatment across the western Sydney including suburbs seven hills, Kellyville, Liverpool Quakers Hill, Glenwood, Penrith, Bella Vista, Toongabbie, Rooty hills, Marsden Park, Stanhope gardens, Baulkham Hills, Westmead, Windsor, and Richmond. Many factors need to be taken into consideration when determining the exact cost of your wisdom tooth extraction. The price will vary from patient to patient depending on the number of teeth that have to be removed while having an impacted or decayed tooth will also affect the amount of money you will have to put aside for this kind of procedure. Removing a tooth that has not fully erupted is usually carried out by an oral surgeon under general anesthesia, which will increase the total cost of the treatment. However, having a dental or medical insurance policy could put some pressure off your budget, while in some cases you could have your tooth removed free of charge. Our office staff will be more than glad to assist you if you are having any trouble with your insurance claims. In typical cases, when your wisdom tooth is growing at a normal angle and isn’t decayed, and you want it removed out of precautionary reasons, the total cost of the removal procedure will be around $200. However, the price of our dental services will rise depending on the type of impaction and the complexity of the procedure required. The only way for us to give you a realistic estimate of the cost of the treatment is to do a complete examination of your mouth and jaw and to review your x-rays. Usually the last ones to develop in life, these teeth are located behind the second molars at the very back of the palate, therefore they are also referred to as third molars. Since their growth process for most people starts between middle teenage years and the early twenties, they are commonly associated with the “age of wisdom,” from which they derive their peculiar name. According to some anthropologists, wisdom teeth have become mostly redundant for modern humans, which could explain why they are causing so many problems for so many people. Chances that you have heard about someone having a hard time with their third molars are high, and unfortunately, these complaints are usually the most painful ones. The positioning of the tooth is a crucial factor in this painful and sometimes unpreventable process. More often, patients report to their dentists only after they experience pain or swelling and by that time, the damage has already been done. Once the damage is done, the recovery and the teeth extraction become much more difficult for patients, who are looking at months of recovery after the painful process of the teeth removal itself, especially in cases involving multiple extractions. Experiencing painful problems with your wisdom tooth does not necessarily mean you will need to have it removed since pain is sometimes a normal albeit unwanted consequence of the tooth growth process. Only after we examine your mouth, jaw, and x-ray films, we will be able to decide what kind of procedure best suits your exact type of problem. In cases where your tooth has become infected, the dentist may choose to delay the extraction procedure and treat you with antibiotics first. In other cases, it is best to give your wisdom tooth some time to push through the gums and find its rightful place in your jaw. At Winning Smiles Dental Surgery, our preferred choice and recommendation is to have your wisdom teeth removed under local anesthetics, meaning that you will be fully awake throughout the procedure. The sheer thought of being awake while having a large tooth pulled out from your jaw can scare away some people, but the procedure itself should be painless and complications and side effects are less common compared to general anesthesia. Listed below are answers to some FAQs about this specific dental problem. If we haven’t answered your question or you would like more information please feel free to contact us. For some people, erupting of wisdom teeth is a painless and sometimes unnoticeable experience. However, most dental experts recommend having your third molars removed early, preferably in teen years, before they cause any problems and complications. Listed below are just some of the benefits of an early wisdom teeth removal. Wisdom teeth are considered a part of normal human dentition in situations where they have enough room to erupt properly, without any pain swelling, or other dental problems. Should I Be Worried About Impacted Wisdom Teeth? Besides being a constant source of pain and discomfort, wisdom teeth that haven’t erupted properly can cause more severe dental and medical problems. Because it is difficult to properly clean the area around a tooth that hasn’t fully erupted, impacted third molars can increase the possibility of catching a gum disease called pericoronitis. Such condition can result in pain, inflammation, while in more severe cases it can lead to the loss of the surrounding teeth. The problem of maintaining proper dental hygiene in areas surrounding an impacted tooth also increases the chance of decay and cavities because of the harmful bacteria and food that gets trapped between the gum and partially erupted tooth. Another thing to worry about when dealing with an impacted tooth is the damage it can cause to other teeth, especially if it is growing toward the second molar. Apart from increasing the risk of infection in that area, the pressure caused by an impacted tooth can disrupt the normal position of other teeth in the jaw and lead to overcrowding. A rare but potentially severe complication is the development of a cyst, a fluid-filled sac within the jawbone. Cysts can deal severe damage to the jawbone, teeth and nerves, and if left untreated, may even lead to the development of benign tumors. Do I Need A Consultation Before Wisdom Teeth Removal? Before you undergo the extraction procedure, you will have to stop by for a consultation so that we can determine whether the benefits of removing the tooth outweigh the costs in your case. During the consultation, our dentist will assess your general medical condition and explain to you the extraction procedure itself as well as the post-operative process. Once our dentist reviews your full mouth x-ray (OPG), which can be taken free of charge, you will be given a final assessment and diagnosis, after which you will be all ready to have your teeth removed. Damage – No matter how well you brush and floss, a lot of harmful bacteria and food parts will get stuck in the area around an impacted third molar. As a result, the adjacent, second molar could also be affected, increasing the chances of tooth decay and gum disease. Disease – In rarer cases, non-infectious diseases such as cysts and tumors could also form as a result of the impacted tooth. Cysts are fluid-filled pockets inside the jawbone with the potential to cause a great deal of damage to nearby teeth, bones and nerves. This kind of condition will usually require surgical removal of tissue and bone. Crowding – For a long period, dental experts believed that third molars directly contributed to crowding and overlapping of the teeth in front of the jaw by pushing those right next to them. The theory has since been disproven through years of well-documented research, but there is still a belief among some people that retained wisdom teeth will contribute to the movement of the front teeth. How to Manage Your Anxiety about Wisdom Teeth Surgery? Dental anxiety is common among patients and it is affecting millions of people every day. No matter if you heard some bad experiences with extraction procedures or not, it is entirely reasonable to be scared. This is precisely why we have equipped our staff members with knowledge and patience to lead you through this process and answer any concerns you might have with ease. We also worked hard to develop a procedure that will help minimize any complications after surgery including pain or swelling. The time frame of the procedure is around 30 to 60 minutes. Thanks to many improvements in the dental and medical field, possible outcomes of the wisdom teeth extraction and post-operative recovery have been reduced to a minimum. You might feel some discomfort a couple of hours after the procedure, once the local anesthesia wears off. Patients are kindly advised to take Nurofen or Panadol immediately if they experience any postoperative pain. In case the recommended medication is not reducing your discomfort, feel free to take stronger pain medication our staff members have prescribed. At this part of the recovery, we usually include Panadeine Forte which will significantly reduce the pain you might feel. What Happens Immediately After Surgery? The gauze your dentist will place over the surgical area should be there for at least 20 minutes to prevent the forming of a blood clot. Avoid increasing your heart rate by exercising or heavy lifting. Resume your daily activities once the pain is reduced to a minimum. What to Expect After My Wisdom Teeth Surgery? The level of pain varies and it is entirely individual. Depending on each individual, the feeling may range from mild discomforts to severe pain. Patients can expect approximately two to four days of recovery. To avoid any further problems, patients are strongly advised to follow our post-operative instructions carefully. By following these guidelines, a more comfortable recovery will be ensured. Pain – We recommend taking your pain medications as prescribed. Please note that the pain following the surgery will subside over a few days. In case the pain persists, you may need further attention, so we advise contacting our office. Bleeding – During the first 24 to 48 hours after the surgery, some bleeding is considered normal. Patients may find some blood in their saliva or the wound during the first couple of days. In case the bleeding gets heavier, follow the instructions you received at our office. Antibiotics – Antibiotics are commonly used to prevent any possible infection, so in case you have been prescribed with them, strictly follow the dentist’s instruction and stop their intake only in cases of sudden rash or unusual reaction. Swelling – It is common to experience swelling, the amount you will encounter will be proportional to the level of surgery that was involved. It will appear the first day after your surgery and it will gradually subside over the next 2 to 3 days. Mild Bruising – Discoloration of the skin is a common post-operative symptom, that will develop within 2 to 3 days after the surgery. Keep the mouth clean – Usual dental hygiene can be resumed after the first day of recovery. We strongly recommended rinsing with warm water and a teaspoon of salt after every meal. Diet – Avoid any sucking motion that could affect already formed blood clot. Sutures – They are placed in the area of surgery to minimize post-operative bleeding and to help healing. Sometimes they can become dislodged and this is no cause for alarm. Just remove the suture form your mouth and discard it. There will be a cavity where the tooth was removed. The cavity will gradually fill in with the new tissue over the next month. In the mean time, the area should be kept clean especially after meals with salt-water rinses or a toothbrush. What Are Possible Complications Of Wisdom Teeth Surgery? ● Dry socket (alveolar osteitis) is one of the most common complications following this type of procedure. It happens 3-5 days after the tooth is removed, when a blood clot fails to develop, or becomes dislodged. ● Nerve injury – In rarer cases, parts of the trigeminal nerve could get injured, leading to a tingling sensation and numbness in some areas of the face and mouth. ● Infection accompanied by high body temperature and persistent pain and swelling. For more information or to book a check-up with one of our experienced dentists in Blacktown or Denham Court, contact us today. Call Winning Smiles today to get an evaluation for wisdom tooth extraction removal. 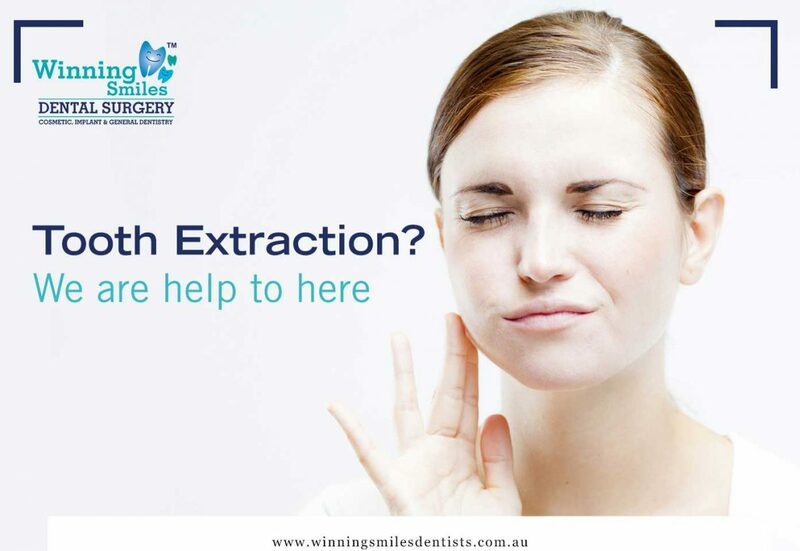 We serve wisdom tooth extraction removal service across Blacktown, Parramatta, Seven hills, Kellyville, Liverpool, Castle Hill, Rooty hills, Marsden park, Stanhope gardens, Baulkham hills, Westmead, Windsor, Richmond. Blacktown, Parramatta, Quakers hill, Glenwood,Penrith, Bella vista, Toongabbie, Rooty hills, Marsden park, Stanhope gardens, Baulkham hills, Westmead, Windsor and Richmond, Denham court, Emerald Hills, Leppington, Austral, Edmondson Park, Gregory Hills, Oran Park, Harrington Park, Gledswood Hills, Raby, Carnes Hills, Prestons, Bringelly, Hoxton Park, West Hoxton, Currans Hills, Liverpool, Campbelltown, Narellan, Mount Annan, Carnes Hill, Ingleburn, Minto.